Kenya Airways is the main airline in Kenya. It has an excellent reputation for quality, and a good safety record. The times I’ve flown with them myself, were very pleasant. They have grown rapidly over the last decade. The airline’s base is Jomo Kenyatta International Airport in Nairobi, the country's capital city. The airline also runs many flights out of Moi International Airport in Mombasa, on the eastern coast, and some from other airports in Kenya. The airline is also a member of the Flying Blue frequent flyer program, part of Air France and KLM. Miles are accumulated by flying on any airline in the program. Rewards for your miles can include discounts on flights, ticket upgrades, and other gifts. 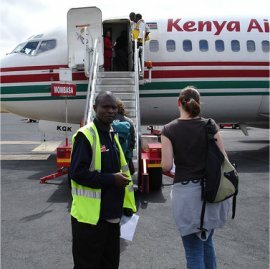 Do look into Kenya Airways if you’re looking for cheap flights to Kenya as well. The planes used by Kenya Airways are all fairly new, with several different models of aircraft making up their fleet. There are 10 Boeing 737s used for all the local or regional flights within Africa. For longer trips and international travel, the airline has more than a dozen larger Boeing 767s, 777s and 787s. 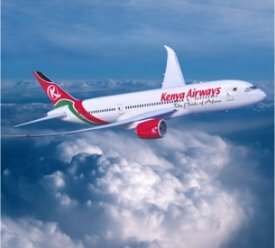 In 2006, they planned to upgrade their fleet to include several Boeing 787 Dreamliners, as the first in Sub-Saharan Africa. The total fleet consists of 24 planes. The former East African Airways was a joint venture, owned by Kenya, Tanzania and Uganda. But in 1977, the group collapsed and was divided into 3 independent airlines: Kenya Airways, Uganda Airlines and Air Tanzania. At that point, the airline was a government-owned entity. By the 1990s, the airline was a publicly traded company, with Dutch KLM being the majority shareholder. Their stock is traded on the Nairobi and Dar-es-Salaam stock exchanges. Today they are a successful and profitable enterprise, and have recently been made an associate member of the SkyTeam airline alliance, which includes Continental Airlines, KLM, Air France and other major international airlines. They also won the African Airline of the Year award in 2005. For your convenience, you can also book all your flights directly from the Kenya Airways website. Their site is extremely helpful, not only letting you book and pay online, but there’s also important information that you should have when arranging your flights. Their interactive tools can help you get visa information or vaccination requirements. You can also find out the latest baggage rules before you start packing. All in all, I can certainly recommend flying with this airline.